Anhydrous ammonia prices are regularly summarized in the Illinois Production Cost Report, which is prepared biweekly by the Agricultural Marketing Service, an agency of the U.S. Department of Agriculture. These prices represent average prices paid by farmers in Illinois. Figure 1 summarizes prices by month beginning in August and ending in the following July. Most fertilizer purchased in the months after August will be applied after the current crop is harvested and would be available for next year’s crop. 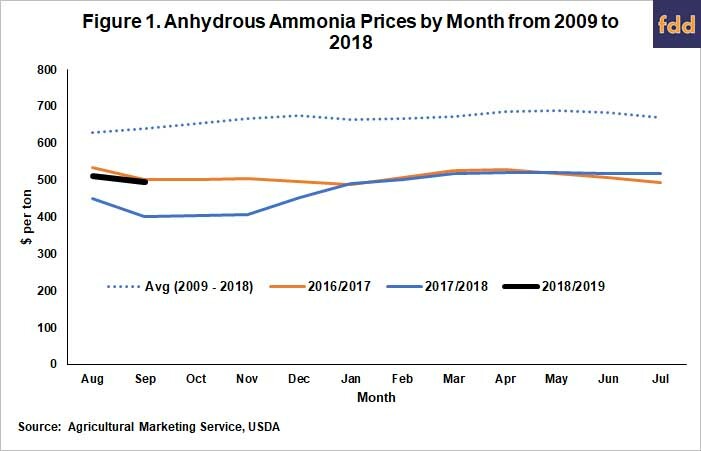 Anhydrous ammonia prices averaged $512 per ton in August 2018 and $496 in September 2018. These 2018 prices were above 2017 prices. The August 2018 price is $62 per ton higher than the July 2017 price of $450 per ton. The August 2018 price is $94 per ton higher than the September 2017 price of $402 per ton. The August and September 2018 prices are near 2016 levels: $533 per ton in August 2016 and $502 per ton in September 2017. The 2018 prices still are below the average for 2009 through 2018: $63 per ton average in August and $641 in September. DAP prices in August and September 2018 also are above 2017 levels (see Figure 2). Average DAP price in August 2018 was $488 per ton, $55 per ton higher than the 2017 price of $433 per ton. DAP price was $506 per ton in September 2018, $80 per ton higher than $426 per ton in 2017. The August and September 2018 levels are below 2008 to 2018 average of $528 per ton in August and $535 per ton in September. 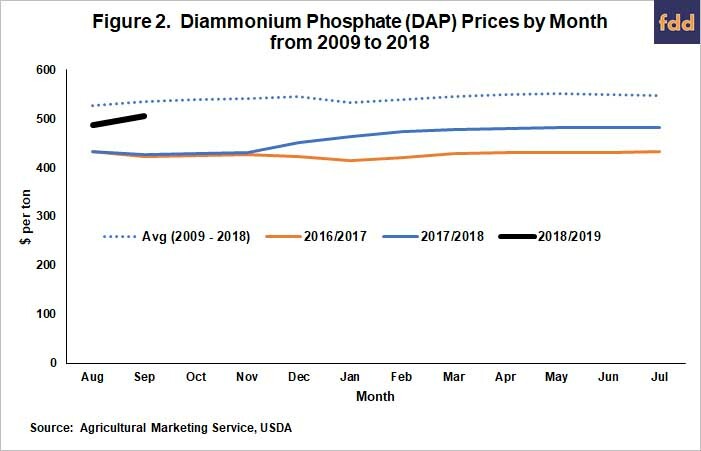 Similar to ammonia and DAP, potash prices are above year-earlier levels (see Figure 3). 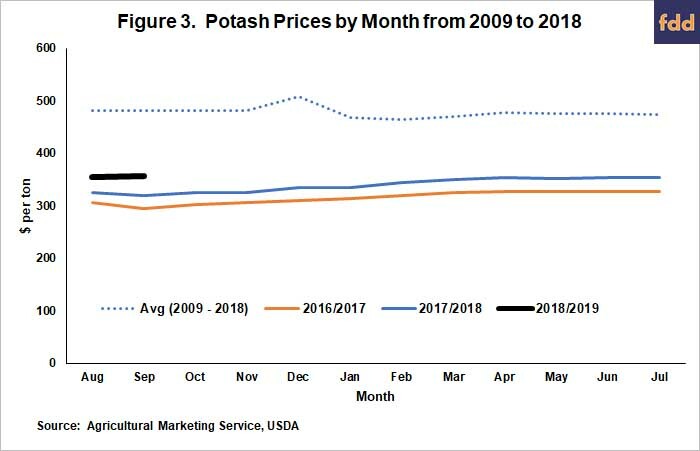 Potash price averaged $354 per ton in August 2018, $29 per ton higher than the $325 price in 2017. The September 2018 price was $357 per ton, $37 per ton higher than the $320 price in 2017. The 2018 prices still are below 2009-2018 averages of $482 in August and $481 in September. The current fertilizer price increases signal higher 2019 fertilizer costs. Current price increases suggest cost increases of $15 per acre for corn and $5 per acre for soybeans. Obviously, cost increases reduce farmer profitability, a situation made worse by current projections of low prices for 2019 (see farmdoc daily, September 18, 2018). Price declines could occur but should not be expected. Historical price patterns suggest price increases and not price declines (see averages in Figures 1, 2, and 3). Moreover, fertilizer prices are highly correlated with energy costs (see farmdoc daily, June 21, 2018). Brent crude oil prices recently reached $80 per barrel, the highest level since 2014 (Ramkumar, A. and D. Hodari). As always, energy outlook is uncertain, with possibilities of larger price movements. Schnitkey, G. "Has the Era of Decreasing Per Acre Corn Costs Come to an End?." farmdoc daily (8):114, Department of Agricultural and Consumer Economics, University of Illinois at Urbana-Champaign, June 21, 2018. Schnitkey, G. and K. Swanson. "2019 Crop Budgets Suggest Dismal Corn and Soybean Returns." farmdoc daily (8):173, Department of Agricultural and Consumer Economics, University of Illinois at Urbana-Champaign, September 18, 2018.